From challenging world-class mountain biking to family-friendly cycle trails, travelling on two wheels is a great way to enjoy the varied landscapes of the Adelaide Hills. Starting just north of Adelaide and travelling to the Outback town of Blinman in the Flinders Ranges, the Mawson Trail is designed for mountain bike or sturdy touring bike use. Close to nine hundred kilometres long, the trail includes little-used country roads, State forest and national park fire trails, farm access tracks and unmade or unused road reserves. The trail takes riders through the Adelaide Hills, traversing forests, farmland and historic towns such as Lobethal and Birdwood before passing through the Barossa and Clare Valley on its way to the Flinders Ranges. The Fox Creek / Cudlee Creek Sustainable Trail network is part of the Mawson Trail and provides the opportunity for a diversity of high quality off-road riding experiences. The network hosts a range of national and local mountain bike, cross country, downhill and endurance races, and has developed a reputation as having some of the best trails in Australia. This thriving mountain biking hub has more than 80km of trails crisscrossing a series of gullies filled with native regrowth forest and features a new beginners’ loop at the top of the network. South Australian National, Conservation and Recreation Parks offer fantastic mountain biking opportunities - for more information click here. Highlights include Belair National Park, Cleland Conservation Park, Shepherds Hill Recreation Park and Sturt Gorge Recreation Park (including the Craigburn Trails) with lots of options for families and novices. 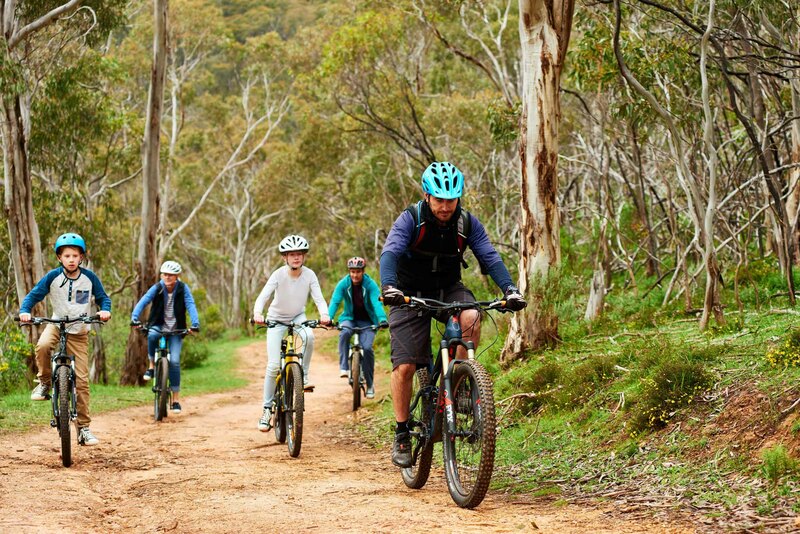 The state's forest network also offers some excellent mountain bike trails, including Kuitpo Forest and Mount Crawford Forest in the Adelaide Hills with challenging options as well as open forest trails suitable for families. Adelaide MTB Trails website has lots of information about these and other mountain biking opportunities in the Adelaide Hills. The 17 kilometre Amy Gillett Bikeway is popular with leisure cyclists and families. Designed for cyclists, walkers and horse riders, the bitumen track follows an old railway corridor running from Oakbank to Mount Torrens. Named in honour of champion Australian cyclist Amy Gillett, this family-friendly track is bitumen and mostly flat, with four loop trails taking in other points of interest. For more information see the South Australian Trails website, Rail Trails Australia website, or the Walking SA website. Belair National Park features a series of shared use trails that are used by walkers, cyclists and horse riders. Cleland Conservation Park also has many fire tracks and shared use trails from which cyclists can enjoy spectacular views of the Adelaide Hills and surrounds. The Mount Barker Linear Trail which runs around Laratinga Wetlands and beyond is also popular. Several trails and boardwalks wind around the peaceful wetlands near Mount Barker, through a broad range of native vegetation. Trails such as the ‘Chestnut Teal’, ‘Rosella’ and ‘Sacred Ibis’ are named after some of the local birdlife. There are also several bird-watching ‘hides’, a picnic and barbeque area, and an environmentally friendly toilet facility. The trails in the wetlands are also linked to the Mount Barker Linear Trail, an award winning seven kilometre shared trail from Laratinga Wetlands to Keith Stephenson Park, following the local creek line. The Kidman Trail is a multi-use horse riding, cycling and walking trail that traverses 225 kilometres of roadsides, quiet farm routes, forest tracks and unmade road reserves from Willunga on the Fleurieu Peninsula to Kapunda in the Clare Valley. It winds its way through the Adelaide Hills from Kuitpo Forest in the south through Echunga, Macclesfield, Balhannah, Woodside, Charleston and Mount Torrens where it meets the Barossa. The Kidman Trail provides a sustainable, safe and scenic trail that highlights the natural beauty, cultural history and major points of interest along the Mount Lofty Ranges. It utilises existing tracks and trails through Forest Reserves and other accessible public land, quiet roads and unmade road reserves with trail markers indicating the route. The trail is proudly named after Sir Sidney Kidman, a prominent local pastoralist and horse breeder. The Tom Roberts Horse Trail Network is designed designed for horse riding and can be utilised by walkers and cyclists.This natural terrain multi-use trail network broadly spans from Cherry Gardens in the north, to Kangarilla in the south and Woodcroft in the west. Established through on-road linkages, road verges and unmade road reserves the network of trails features Adelaide Hills locations such as Cherry Gardens, Coromandel East, Clarendon, Scott Creek and Kangarilla. The challenging terrain of the Adelaide Hills features heavily in the Santos Tour Down Under bike race held annually in January. This UCI World Tour event brings the world's best road cycling teams to South Australia and is immensely popular with cycling enthusiasts who line the route as spectators, and take part in the public participation ride. Escapegoat Adventures offers guided rides through the Adelaide Hills including a winery tour from Kuitpo and their Lofty Descents trip from the summit of Mount Lofty all the way down to Adelaide, though stunning native bush, and visiting Cleland Wildlife Park along the way - it's all downhill! Custom private and group trips can also be arranged with bike hire also available. Bike About in Woodside offers mountain and road bike hire as well as a range of bike tours in the region. How about a winery tour by bike from Hahndorf? There are self-guided and guided/supported options. The bike hire service is conveniently located right on the Amy Gillett Bikeway however delivery to other location is also available. Large groups can be catered for. Will Ride in Stirling offers sustainable mountain bike activities including tours of the region using E-Bikes. Tours are designed specifically to cater for the interests, fitness, experience and time that suits participants - from two hours to two days, with or without accommodation, and for individuals and small groups. Greenbanks Tours offers a guided ride along the Amy Gillett Bikeway which runs between Oakbank and Mount Torrens. More information is available from Bike SA and the South Australian Trails website. Remember that the hilly terrain can be demanding so you'll need to carry plenty of water, sunscreen and a repair kit. Also keep in mind the Trail Users' Code of Practice to protect the environment and ensure the safety of all riders and shared trail users. Key points include only riding on established tracks and trails, planning your ride, complying with signs and respecting the rights of others. There's more than a day's worth of cycling trails in the region so why not spend the night in the Adelaide Hills and wake up in a cosy cottage, family cabin, luxury villa or boutique hotel? Check out our extensive range of accommodation which can be booked online.